Michelle and I have made doggy biscuits at home many times now. The first couple times it was after making chicken stock and realizing that we could puree the stock vegetables with some of the loose chicken meat from the bones… That worked really well actually, but the cookies would go bad (in the cupboard) faster than we could feed them to our three dogs. Then a couple times, we made some dog treats using left-over mashed potatoes, and that also worked really well. While shopping for some kitchen essentials at a restaurant supply store in Toronto’s chinatown one afternoon, we stumbled upon a bone-shaped cookie cutter – the only one in a huge, unsorted pile of metal cutters – and for less than $1, buying it was a no-brainer. So since then, we’ve been making bone-shaped dog cookies and have gradually started to perfect our technique. 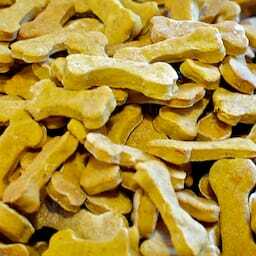 Our three dogs go crazy for these and will do anything for just one more… And we have the satisfaction of knowing exactly what’s in them, which is especially important since our youngest dog, javier, has food allergies. First, start by boiling two potatoes and let them cool. Put all the above ingredients in a small sauce pot and cover with water. Boil until the carrots are tender – there shouldn’t be too much water left in the pot by the time it’s done. Let this cool then put it into a blender with only the peel from the two boiled potatoes – blend this until it’s a smooth puree. Start by softening the peanut butter (using a fork) in a large metal bowl and then push this to the side of the bowl. In the same bowl, mash the two potatoes with the fork, then add in the egg to the potatoes. Combine the peanut butter with the mashed potatoes and add the puree, baking soda and baking powder. Use an electric mixer to combine the ingredients and then add flour ½ a cup at a time. Remember, I measure with my eyes so you may need more, or less flour. You want this to end up being a dough that you can roll out so half-way through, you’ll have to start using a wooden spoon (or your hands) and not the mixer anymore. You’ll want to chill the dough in the fridge before you roll it out, but it doesn’t have to be for very long. Preheat your oven to 400°F while you roll out the dough and cut out the cookies – don’t forget to flour your rolling pin, cookie cutter and counter. The cookies will rise in the oven so you don’t want to roll them out too thick – about 1/8 inch is best. Once the cookies are cut out and assembled on a parchment paper-lined cookie sheet, place them in the oven and immediately turn the heat down to 325°F. Bake for ten minutes, then flip the cookies and bake them for another ten minutes. Remember to put the dough back in the fridge between batches. that’s it – pretty simple, and our dogs seem to love them. You can stay up-to-date with Lorenzo, Cachita & Javier by following @the3dogs on Twitter. 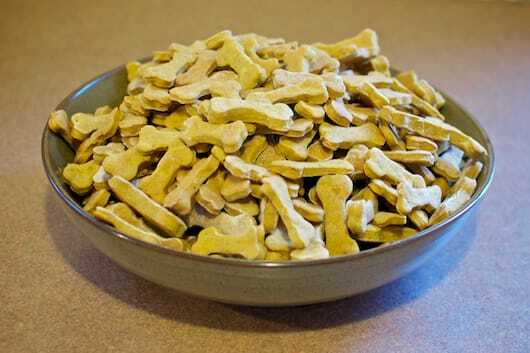 Homemade Doggy Treats was published on Monday, October 3, 2011 at 2:00pm EDT by Daniel Menjívar and last updated on April 11, 2018 at 9:30pm UTC .